Speed training for ultra runners – Essential or a waste of time? If you are training for a 100k or 100 mile race is there any point including speed sessions in your training? When the winning time in most of these races is slower than 5 minutes per kilometer you may think not. If the fastest runners are running that slow then surely speed is the least of your concerns? Whilst that may intuitively make sense I believe there are a number of very good reasons that all runners should include speed work in their training even if the race is 100 miles long. Often referred to as your VO2max your maximal aerobic capacity is a measure of the maximum amount of oxygen your body can utilise during intense or maximal exercise. Elite endurance athletes have very high values , Kilian Jornet ( course record holder and multiple winner of the UTMB) is reported to have a VO2 max of 92. As we age our VO2 max starts to decrease for a number of reasons so including some HIIT in your program will help stop the decline of your maximal aerobic fitness. Lactic acid is the bad guy in running but research is showing that it’s really a good guy in disguise. The body can be trained to take the lactate part of lactic acid and use it for energy. High intensity workouts can teach your body how to utilise lactic acid as a fuel source. This allows you to exercise at a higher intensity for longer or recover quicker from a period of higher intensity work like climbing a hill. The pace at which you can run a marathon at is dependant to a large degree on how fast you can run a half marathon. If your half marathon PB is 1.30 then you aren’t going to break 3 hours in a marathon. Elite marathon runners know that if they can’t run 10km in under 28 then they have no chance of running a marathon in under 2.08. Are you doing track sessions as part of your ultra training? There is a similar rational for ultrarunners. Being able to run shorter distances faster means that you should be able to run slower for longer. Someone who can run 10k in 35 minutes will find running at 5 min k pace very comfortable whereas someone whose 10k time is 45 minutes will find it harder to maintain 5 min k pace. Any type of training that can improve your speed at shorter distances will help your speed at longer distances (provided you do a suitable amount of endurance training as well). 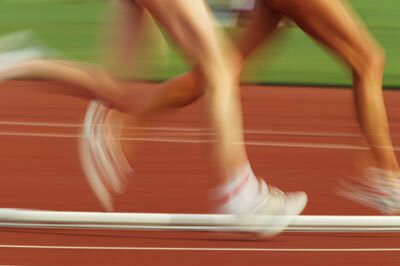 Running at a faster pace means your muscles go through a greater range of movement than running at a slow pace. Running lots of miles at a slow pace means your muscles will adapt to the reduced range of movement. The problem in an ultra is as we tire our muscles tighten up, further restricting our range. This results is your running reverting to a shuffle and then eventual walk. Having a greater range of movement means that as your legs tighten you are still able to run effectively. Running economy is a measure of how much oxygen you use to run a certain pace. The more economical you are the less oxygen you will use. Economy is independent from VO2 max. Two runners with the same VO2max may have different running economies which means the more economical runner will find it easier at a certain pace than the other runner. Factors influencing running economy range from the ability of your body to utilise elastic energy, your biomechanics, and the neuromuscular and biochemical process that occur in your body during exercise. Speed training has been shown to improve all of these factors. 5. Force Your Body To Adapt. Training is based on the overload principle. Apply more stress on the body than it is used to and it becomes stronger thus better able to withstand the stress next time. Too much stress of course will just lead to injuries. If we are running at a slow pace then the only way to overload the body is to run further. This obviously has its limitations. Most of us have a limited amount of time available for a long run and the longer the run the more recovery time we will need. For example you may be able to recover from a 30km run in a day, 40 km in 2 days but after 60 km you may need 3-4 days off. Are the benefits gained from a 60k run worth having 3-4 days off? Speed training allows us to overload our bodies in a short period of time and because the volume of training is low recovery is quicker. Are These Factors Relevant In Ultrarunning? For most ultras the key is to set off at a pace that feels very comfortable and try and hold that for as long as possible and then hope you don’t slow down too much in the later stages. What defines your comfortable pace ? A combination of your running economy , VO2 max, biomechanics and neuromuscular and biochemical processes all of which can be improved by speed training. Learning to run when your legs are tired is an important part of training for an ultra. There are a few ways to fatigue your legs, one is to run for a long time and the other is to run faster. Doing a long run the day after a speed session is a great way to train your legs to run when tired. A one hour speed session can be as useful as a 2-3 hour run. Whilst ultrarunners obviously need to incorporate some long runs into their program speed training provides a time efficient means of boosting performance. Can Marathon and Half-marathons Be Counted As Speed Training? I often hear ultrarunners talking about how they did a marathon on the weekend and counted it as their “speed” session. Whilst they might have run the marathon at a significantly faster pace than an ultramarathon, a marathon cant be considered speed work as it doesnt stress the body in the same way that speed work does. Yes it may place a large stress on the muscles but for most of us our lactate levels, oxygen consumption and heart rate is nowhere near high enough to stimulate the same training adaptations that speed work does. If you arent used to running fast then heading out to the track and running 400m repeats is a sure way to injure yourself. Just like it is necessary to build up your mileage slowly it is also necessary to gradually increase your speed work. For runners not used to speed work fartlek training is the best way to introduce some into your training schedule. Simply include some faster paced efforts randomly during a normal run. These efforts may be as short as 100 metres or as long as mile. They are not all out efforts, merely faster than your normal pace. As your body adapts you can increase the speed and number of efforts. What Kind Of Speed Training Is Best For Ultra Runners? There is no one size fits all training approach as each individual responds differently to different training sessions. What works for one may not work for another. There are a wide variety of speed training sessions you can do ranging from 100m uphill bounds to hour long Tempo runs. Future blogs will go detail how to do some of the more common sessions ultra runners should include in their training routine. To find out more about Andy, visit his website here. I’d agree wholeheartedly, great post. Nice article Andy. I definitely benefit from doing 2 track sessions each week (from 400m up to 3km efforts…typically 10km speed sessions). Pingback: De la vitesse pour améliorer l’endurance ?